As Madagascar: Escape 2 Africa opens, Alex the lion (Ben Stiller), Marty the zebra (Chris Rock), Melman the giraffe (David Schwimmer), and Gloria the hippo (Jada Pinkett Smith) are about to literally launch out of their adventures in the first film, only to quickly find themselves once again crash landing, this time in their ancestral home on the wild plains of Africa. Tagging along from the original are the scene-stealing gang of conniving penguins�led by Skipper (director/writer Tom McGrath)�and the wonderfully bizarro lemur King Julien (Sacha Baron Cohen) and his right-hand man Maurice (Cedric The Entertainer). Early on there's what I imagine to be fairly frightening sequence (for young kids, that is) that details how Alex originally ended up at the zoo in New York, forcibly removed from the comforts of his game reserve home in Africa. This all serves to provide a nice recap of the events of the first film, including the presence of durable survivalist granny Nana (Elisa Gabrielli), who gets a somewhat more expanded role here as she goes up against Alex on a number of occasions, including a truly bizarre fistfight between the two. Eventually the main story arc kicks in, with dance-loving Alex having to prove himself to the pride as a fitting king or risk banishment, especially against the villainous lion Makunga (Alec Baldwin). A dry waterhole, a volcanic sacrifice, cross-species romance, a rite of passage, and the struggle with being unique all merge together, and if you're wondering if things turn out okay then you really need to see more movies, my friend. The original Madagascar creative team of Tom McGrath and Eric Darnell return as co-directors�as well as sharing writing credits with Etan Cohen (Tropic Thunder)�and I took a perverse pleasure in seeing in-joke gags inspired by the Twilight Zone episode Nightmare at 30000 Feet, as well as Lawrence Of Arabia and even the "serpentine" bit from Peter Falk/Alan Arkin film The In-Laws. That's a nutty cross-section of references in what is marketed as a kid's movie, and throughout the level of humor often seems more geared for older viewers than young. Sure, there's plenty of wacky and funny action shtick for the kiddies, but many of the setups and jokes wisely carry a deeper and more grownup subtext. And it's funny, too. I tend to look a little askew at sequels, because historically they fall way short of their corresponding original. And animated films, for some reason, seem to be the worst offenders, and as a cynical adult it often seems there just trading on the name recognition (yes, Shrek and Ariel, I'm talking to you). I expected a hollow regurgitation of events and jokes, considering the fish-out-of-water premise is virtually identical to the first Madagascar, but this one easily stands on its own. The humor is sharp and funny, the animation runs the gamut from gorgeously lush to creatively manic, and most importantly, it made me laugh quite hard. I can't really ask for too much more than that. Image Transfer Review: Dreamworks has issued this sequel in 1.85:1 anamorphic widescreen, encoded in AVC MPEG-4 at 1080p. This one is really a showcase disc for the format. Colors are bright and vibrant (the blue African sky, for example), and the edges are so crisp and well-defined that it almost appears three dimensional at times. There is a great degree of detail�from tiny chest hairs on hippos and chin whiskers on giraffes, to the intricate movement and textures of water, grass, and dust�that is revealed with razor-sharp clarity in every scene. Easily one of the best BD transfers I've seen so far. Beautiful. Audio Transfer Review: The English Dolby Digital 5.1 TrueHD audio mix more than holds its own next to the striking image transfer, delivering an appropriately aggressive and encompassing soundstage. Character voices are crystal clear�even throwaway lines from background creatures are easily heard�but where the mix excels are the sound effects. All channels are used, and used hard, as elements such as crashing planes, animal sounds, and walls of water create a wonderfully full and layered experience. Extras Review: Lots of HD supplemental content here, beginning with a technical filmmaker's commentary track (with optional subtitles) from co-director/writers Eric Darnell and Tom McGrath, along with producers Mark Swift and Mirielle Soria. Much of what is discussed can be gleaned from some of the other featurettes�story development, traveling to Africa, etc.�but the Animator's Corner option allows a PIP that shows Darnell, McGrath, Swift, and Soria, but also carries test footage and the animator's at work during the production. A Trivia Track option provides the chance for an additional layer of production factoids. Next up is a quartet of fairly generic EPK pieces, covering some of the usual and expected production areas. It's A Family Affair: The Cast Of Madagascar: Escape 2 Africa (09m:10s) is a frothy peek at the voice talent, The Making of Madagascar: Escape 2 Africa (11m:03s) attempts to give an overview, with an interesting discussion on creating the various blades of grass, Crash Landing (03m:38s) examines the work of the animators on the film's manic plane crash, and African Adventure (07m:15s) follows the creative team on their pre-production trip to Africa in order to "see what it's all about." Less EPK and more educational, The Bronx Zoo: Madagascar (08m:14s) examines the development of an exhibit�influenced by the success of the first Madagascar�at the New York zoo. The rest of the material is a bit more kid-friendly, beginning with Jambo Jambo: Swahili Speak, where we're given the chance to learn a few practical phrases in another language. The More Penguins section contains two twelve-minute episodes (Popcorn Panic and Gone In A Flash) of the new Nickelodeon series featuring the scene-stealing birds, while the Mad Music area houses five "music videos" with characters from the film (Move It, Move It, Big and Chunky, She Loves Me, Traveling Song Sing-A-Long, Alex's Dance Moves) as well as the Dreamworks Animation Jukebox. The jukebox section is the same idea, providing music video bits from a number of Dreamworks films, among them Shrek, Shark's Tale, and the original Madagascar. A somewhat clunky Test Flight Of Air Penguin game requires the remote to help fix the plane or some such nonsense, and calling this a "game" is a bit of a stretch. The optional BD-Live content connects to pleasant-but-hardly-earth-shattering material like the featurette The Heart Of A Lion that looks at a real-life lion pride. The whole BD-Live experience has not quite lived up to the hype yet, so for know we take what we can get. The disc is cut into 23 chapters, and features optional subtitles in English, English SDH, French, Spanish, and Portuguese. And if you're bored, look for a number of wacky penguin-inspired Easter eggs sprinkled throughout. 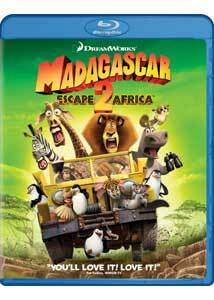 The fact that I can't get the song Move It, Move It out of my head notwithstanding, Madagascar: Escape 2 Africa overcomes the typical curse of animated sequel-itis by being just as funny�if not more so�than the original. With an immaculate set of audio and video transfers, this one actually looks and sounds better than the first film, and on BD is a veritable explosion of color and detail. An eye-popper visually, but it also succeeds in being immensely entertaining.